Well, are you? Or, more importantly, is your audience feeling you? Understanding you? Connecting to what you’re putting out there? To get a resounding “yes!” to these questions you need to concern yourself with resonance which is, among other things, “a quality that makes something personally meaningful or important to someone.” Or in the words of Tony Schwartz in his book The Responsive Chord "Resonance takes place when the stimuli put into our communication evoke meaning in a listener or viewer." 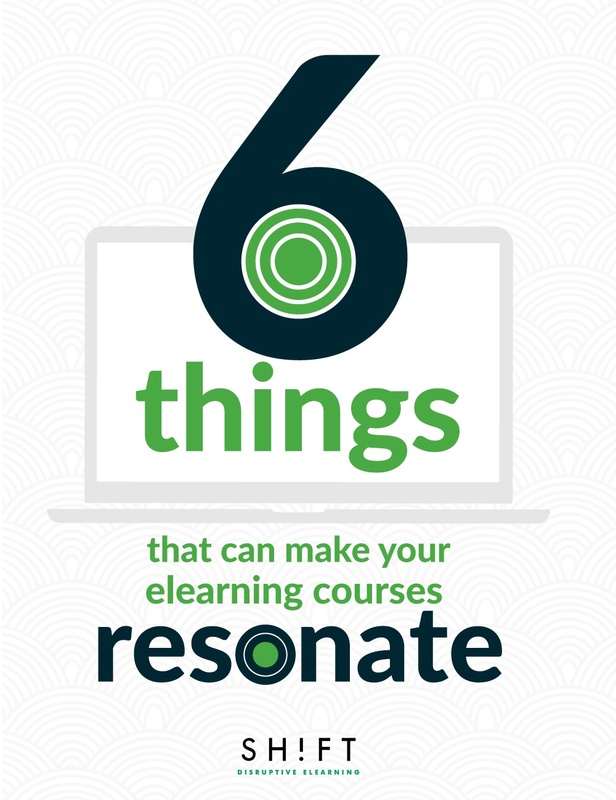 But why is resonance so necessary to eLearning course design? Another definition for this concept has to do with sound and “the reinforcement or prolongation of sound by reflection from a surface or by the synchronous vibration of a nearby object.” In simple words; this means one vibration causes another vibration or a ripple effect. For your audience, if you pluck just the right heartstring for them, their learning process gets easier because one piece of information will set off reminders of other knowledge, making it simpler to connect them all together, so they don’t feel like so many individual things to remember. And when things are easier they are more likely to continue with your course and retain information. Your lesson will resonate when your audience feels it, understands it and becomes mentally/emotionally invested in it. As an eLearning designer, you need to be in sync with your students, to harmonize with them, their goals and their experiences. This is the only way to fight your way through the content crush, or oversaturation of content and information that your audience is subjected to each day. Who are you designing your course for? Answering this question will give you much greater insight into how you should design your course. The language you use and types of graphics, references, overall design and more can all be determined by knowing who your audience is. Start designing without actually considering whom your audience is and what their experience level is with the subject matter will inevitably lead to a poor execution of the material. For example, top executives would likely want to see numbers and statistics presented while a project manager would need to know more about methods and techniques. Giving your audience what they need and want gives your course value. It won’t matter how clearly the information is presented or how nice the course looks if the information isn’t geared towards the right audience. You can start this by speaking their langue at their level. While you never want to be patronizing, you also never want to talk above your audience either. Relate to them with words and phrases that will appeal to them and show that you understand their issues. • Why should my audience care about this? • Is it worth their time? Purpose: Often, the thing that will make your audience care is if your course has a clearly defined purpose. Think of how frustrating it is when you attend a conference or see a presentation that doesn’t have a clear message. Give some thought to the “why” or the "soul" of your course and create it with the answer always in mind. If you find yourself veering too far away from this focus, then you need to rein yourself back in. This is all part of what will help your content resonate. Your learners should never feel like they are wasting their time. Keep things relevant and as to the point as possible, which will make the want to engage and stay engaged. Make them feel smarter: Tell them how to do something, or solve a problem. Aka. Tips and life hacks. Lead them to discovery: Shine a different light on things they are already familiar with to help them see things differently and discover something new. Transform them: Giving an example of what their life could be different before and after your course helps you frame the relevancy of why your course is valuable. This gives them a clear goal and idea of what to expect, a point in the distance to focus on. Hook them right in the beginning: It doesn’t matter how thrilling your second screen is if your learners get too bored to finish your first one. This is why you need to hook them right away and show the relevance of what you are about to say since slide #1. Empathizing with your audience and demonstrating that you honestly understand their concerns and why they are here gives your course credibility and a reason for learners to continue reading. Jennifer L. Aaker, Stanford University Professor of Marketing states that a story is memorable, personally relevant and impressive when it is meaningful. Based on her experience and research, an audience receives a message differently when it is presented with context and examples vs. purely with statistics. People feel connected when there is a story, but caution that a story shouldn’t take the place of statistical facts. The growing trend will see storytelling and data being reported together to form an informational product that will resonate with people in an intellectual and emotional way. When creating a story for your eLearning course think: What stories would be of interest to my audience? What is the purpose of my course and does the story get me closer to that purpose? How, when, and where can I add story elements like characters and a plot? Encourage exploration. Structure your content so that it follows a natural path the way a story would. Include interactions. Elements such as scrolling interactions, tabs, and sliders help further engage and interest your audience in discovering and revealing answers to their questions. Tell a story of transformation: It might not be fun to talk about low points, but they are highly relatable. Your audience will get far more out of hearing about how a company worked past its difficulties to get to a better place than they will simply hear how great a company is now. These are the stories that make us feel connected and help put us in the shoes of the characters in the story. We are naturally prone to feeling emotions and can experience many within the span of a very short time. Tapping into this natural inclination will up the chances of your course being memorable, exciting and enjoyable. While we say that a course is more enjoyable when it triggers emotions, that doesn’t mean the emotions themselves have to be good. We can feel happiness and joy but often anger and sadness are just as memorable (if not more so). The point is you should make learners feel something. Even a bad feeling is better than no feeling. Don’t be scared to dig deeper, get personal and get emotion. It will pay off. A sense of wonder, awe or humor is also very memorable. Think of the things people often share on social media and you’ll have an idea of the types of emotions people like having and spreading. People want to be surprised and amused above most things. Fear: Fear is a common emotion for marketers, and you can use it in your courses too. If your course is on investing, you can easily incorporate a story about people who didn’t properly invest and how bad it was for their future. Time/Lack of Time: People are increasingly busier and are pretty much constantly looking for ways to save time on things they don’t want to do so they can get to things they do want to do. Telling your audience how taking your course can save them time can be a pretty effective way to trigger interest. Influence: Many of your students may be taking your course to advance in some way in their career and appealing to this interest is huge. Letting them know your course will get them higher on the corporate ladder or that they will in some way be leading the pack will appeal to their need to feel like they are leaders and are in control. Think about how many times you had to learn something in school and it became impossible because you just couldn’t see how it was ever going to apply to your real life. Now consider how much more likely you would have been to focus in if your teacher could have drawn a connection between learning that info and making more money later or something else similar. Simply put, you can’t rely just on telling your audience things; you have to show them to give them something real to hold onto. Explain what you mean conceptually but then show how that applies to the real world. These examples can be real or theoretical, but they must show what can actually happen. Lynell Burmark, a psychologist, and visual literacy writer and speaker writes: "...unless our words, concepts, ideas are hooked onto an image, they will go in one ear, sail through the brain, and go out the other ear. Words are processed by our short‐term memory where we can only retain about 7 bits of information (plus or minus 2). This is why, by the way, that we have 7‐digit phone numbers. Images, on the other hand, go directly into long‐term memory." In another study conducted by John Medina it was found that after 72 hours people only remember around 10% of they heard, but if an image was shown along with that verbal info, retention rose to 65%. Since a video is basically a lot of pictures all strung together, that volume equates to even more of an impact. Video is even more likely to stir our emotions and get us riled up in some way. It is also one of the most effective ways to tell a story. There are also some things that just can’t be conveyed any other way as well. Selling something that has significant features such as speed or movement can only adequately be portrayed with video. Things like a fast car or a demonstration of how easy a new kitchen gadget is to use can really only be seen properly in a video. Create an experience for your audience that they simply can’t say no to. An experience they want to share with their peers, and that makes them feel like they are better for it. The major wow moments in our lives are things like marriage, travel, and new experiences. Creating this in your eLearning course means going above and beyond what your audience expects. This means over delivering and doing it well. You create a sense of anticipation with just the right title, and they come away feeling as though it was speaking to them, or resonating with them. The experience is so good they want to pass it along and this, again, is why resonance is so important.